With the success of my new vegan cake sponge recipe, I made one more cake (totalling in 3 sponges). Each cake was split in two, creating 6 layers. I then built up 2 cakes using 3 layers each, with buttercream and jam between each layer. The cakes are made in a 6” cake tin, and are 4 inches high. Recipe available here. Whisk your shortening and butter together, and then add your icing sugar gradually. Put your whisk on a slow speed to begin with, so the icing sugar doesn’t fly everywhere. 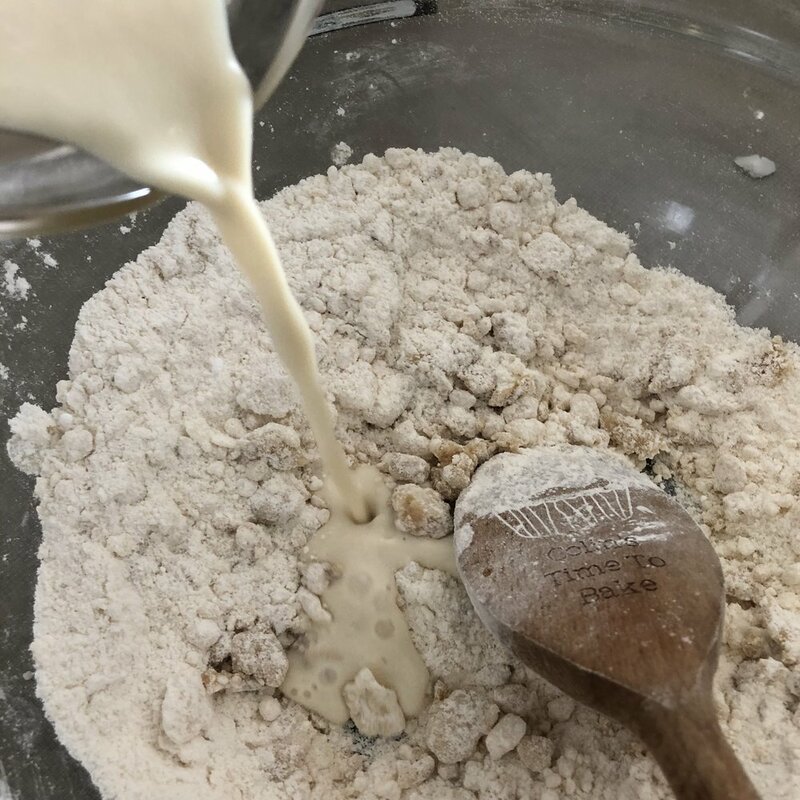 You should be aiming for a good stiff consistency, so keep adding the icing sugar until it is thick enough to hold onto the whisk, but not too thick to spread. Jemma from IcedJems always says, heat your buttercream a little to loosen it- don’t add extra moisture. Thanks Jemma. This amount should be enough for each layer, and a basic crumb coat from each cake. Pop your cake into the fridge until it’s time to decorate. Both cake requires an additional batch of buttercream each, from the recipe above, for the decorations. Use the cornflour on your surface if you worry the fondant will stick. Just enough to lightly dust the surface. Once covered, its time to decorate! Make a horn by shaping some fondant over a wooden dowel, you can paint the horn gold, or colour it beforehand. You can score lines, or wrap a sausage around the dowel to create the horn details. Leave some of the dowel sticking out, like a lollipop. Stick into your cake where you wish the horn to be. Decide on your colours for the mane, and pipe swirls and shapes around the horn however you desire. Where I went wrong was trying to make a “side on” horse face… which didn’t work- and thus, I recreated it as a huge fringe. Make ears by using leftover fondant. Turn them into triangles and place on either side of the horn, where the ears would be! Use the piped buttercream to hold them in place. For the facial features, you can create them out of fondant and stick them on, or use food colouring with a little vodka/lemon juice and paint on. Voila! That is how I created this! What I learned is: Have a plan, sketch it out, then decorate. But as per usual, I went in piping bags blazing…… and had to edit. Piping bags and a turntable. Take your cake out the fridge, place onto the turntable. I tried to create a ‘naked cake’ with this one, though the online community didn’t quite like it/understand my aesthetic. You do what works for you. If you feel you need another buttercream coat to make it solid- go for it! Add your first rose colour to your piping bag with the Instant tea rose attached. Pipe loads of ‘roses’ over the top of the cake. Switch to your second colour, and fill in the gaps. Then sporadically and as creatively as you desire, pipe the green ‘leaves’ between the roses. I wish I could offer help on creating the perfect roses, but I am still learning.